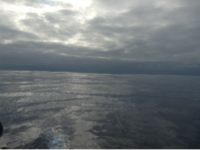 Previous PostElsa’s new route: Q&ANext PostDay 39: Sampling, weather, dolphins and a turtle! The males have red breasts which they inflate as part of their mating display. If you fancy a longer trip, head down to the Galapagos to see more of these amazing birds! Congratulations on your progress so far and good luck as you head to Mexico! I think you definitely made the right decision to change course. You are an amazing woman whose strength and courage are an inspiration. I look forward to hearing about your “new” (and continuing) journey. 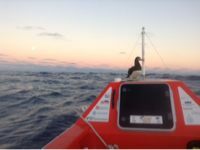 It’s a Brown Booby on board! They are close relatives of Gannetts, which you might see in the Atlantic. This one’s an adult. They occasionally come as far north as Monterey but are common down there, and, as you’ve seen, very comfortable hitchhiking on boats (but, like any marine mammal or bird, not the most courteous houseguests). They’re marvelous to watch fishing: they dive-bomb and then fly underwater to catch little fish, sometimes by the squadron. Frigatebirds are longer, sit more horizontally, have a white throat patch rather than white belly, and are also quite awesome. You might see them as you get closer to shore. Watch for the very long pointed wings and long, forked tail. They’re acrobats who steal other birds’ fish. Elsa, big warm hugs to you and 100% support for your smart decision to go with the ocean’s mandates. You’re an ocean rower, no less than anyone else out there. You’ve traveled a thousand miles (!!!) on your own power. You’ve delved into your own reserves, found out what’s down deep inside, learned what you can handle, survived on your own resourcefulness, learned a new topography of your self as well as of the ocean, and experienced far more than most of us will dream of, just by leaving land. Now you’re wrangling a totally new adventure, unlike that of the others who will arrive in a well-known port. You’re rowing into the unknown. How exciting! I wish I were down in Baja watching for you on the horizon. It’s a beautiful land you’re going to meet. And meanwhile you’ve seen pilot whales!!! I’ve never seen one. How wonderful, and two groups at that. I can’t wait to hear what else you discover in the next few days. You have made a hard decision but the right one. I have been following you and Sarah Outen for weeks , traveling in opposite directions in the Pacific. 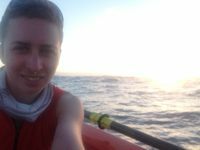 Sarah had to change her destination as you know last year and has been continuing her journey in a kayak. I hope the rest of your trip won’t be so grueling and that you will make landfall somewhere nice and interesting. I met you in Corn Street , Bristol last year and hope to meet you again sometime if you give a talk about your experience. All the best, Margaret Gorely.